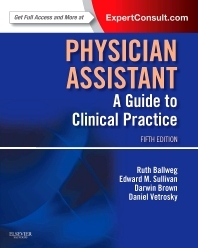 Prepare for every stage of your physician assistant career with Physician Assistant: A Guide to Clinical Practice, 5th Edition - the one text that takes you from your PA coursework through clinical practice! Concise, easy to read, and highly visual, this all-in-one resource by Ruth Ballweg, Edward M. Sullivan, Darwin Brown, and Daniel Vetrosky delivers the current, practical guidance you need to know to succeed in any setting. Master all the core competencies you need to know for certification or recertification.